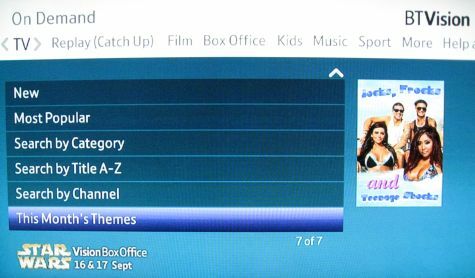 Details of the channels and on-demand TV shows, movies, sport, music and kids content available with BT Vision. BT Vision is a digital TV service. You get a special BT Vision+ box which will let you watch and record live digital TV channels, as well as watch a huge selection of extra TV shows, movies and sporting events on your telly over the Internet. Cost: There are two choices: Subscription-free (pay for any on demand content you watch), or a package that lets you view over 5000 TV shows on-demand, as well as Catch-up TV shows from £12.50 a month. You can sign up at btvision.bt.com. Installation: You can install the service yourself – no engineer needs to visit, and no satellite dish. What channels do you get on BT Vision? The live channels you get on BT Vision are the ones that you find on Freeview (via a TV aerial) – see our Freeview channel list. Additionally, you can get ESPN and Sky Sports 1 and 2. The rest of the content is available "on demand" – this extra content isn’t available as a TV channel, but as a library of programmes to download and watch on demand. The rest of this page outlines what’s available on demand. 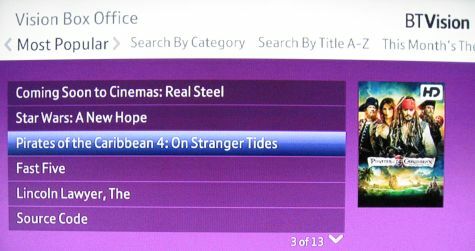 BT Vision offers a huge collection on TV shows and films on-demand. You can get to this content either by taking out a TV viewing pack, or paying per-show / per-film. Live TV is supplied using Freeview – see our Freeview channel list. Extra ‘on-demand’ content is available for download. This isn’t like a traditional TV channel… there’s a huge store of TV shows from a range of TV content providers that you watch via BT Vision over the ‘net. TV content is available from a number of content providers, including: the BBC, ITV Net Player, 4 on Demand, Demand Five, History, Warner TV, CBS, National Geographic, ABC, Sony Entertainment, Chanimal, E!, Living, HBO, MTV, TX, Comedy Central (formerly Paramount Comedy), Discovery on Demand, Battlefield Channel, and Adult Swim. 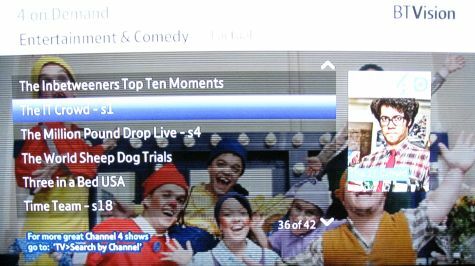 TV Replay 4 on Demand: Programmes from Channel 4’s on demand service 4oD, including Countdown, Hollyoaks, Dispatches, Deal or No Deal, Relocation, Relocation, Relocation, Skins, The Daily Show, The Hustlers, The Market. Bollywood – With Vision’s "Bolly and Beyond"
High Definition: From September 2008, a number of HD films became available for download over Broadband with BT Vision, and now, a number of HD TV shows are also available. New HD film releases cost £4.99 per download, with older titles for £2.99. BT Vision Sport offers sporting content to BT Vision customers, including content from Sky Sports and ESPN. With BT Vision, you can get ESPN for free (on the Vision Unlimited pack). BT Vision started offering Sky Sports 1 and Sky Sports 2 cheaper than Sky in 2010. Other sport available on BT Vision includes Clydesdale Bank Scottish Premier League action, as well as Live Italian Serie A, Live German Bundesliga, Dutch Eredivisie, Russian and Portuguese football, Orange French Rugby, UFC, Major League Baseball, NHL Hockey, Deutsche Tourenwagen Masters touring cars, FIBA European Basketball Championships and NCAA Basketball. 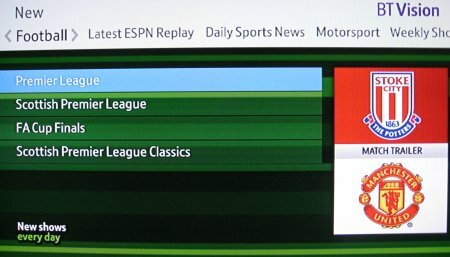 You can access ESPN Replay, for Premier League, UFC, Boxing and more. There’s also a huge archive of classic sporting action available on demand, including classic football matches, boxing, cricket and rugby. The BT Vision Music service includes music videos, concerts and Music Extras. Categories include "Back to Back Videos","Legends Live", "Classic Albums" and Music from the BBC". Music videos: Hundreds, mostly priced 29p. BT Vision launched "Bolly and Beyond" in September 2009, offering Bollywood Movies, TV, Music, Kids and Regional content (Gujarat, Punjabi, Bengali), for lovers of music and entertainment from the Asian Subcontinent. Please see our BT Vision FAQ for answers to frequently-asked questions. More on Internet-based TV on our dedicated Internet TV Options page.